Figs trees have a good resistance to pests and diseases. Even the best fig tree can succumb to problems. In most cases, these problems may be caused by lack of maintenance around the plant. 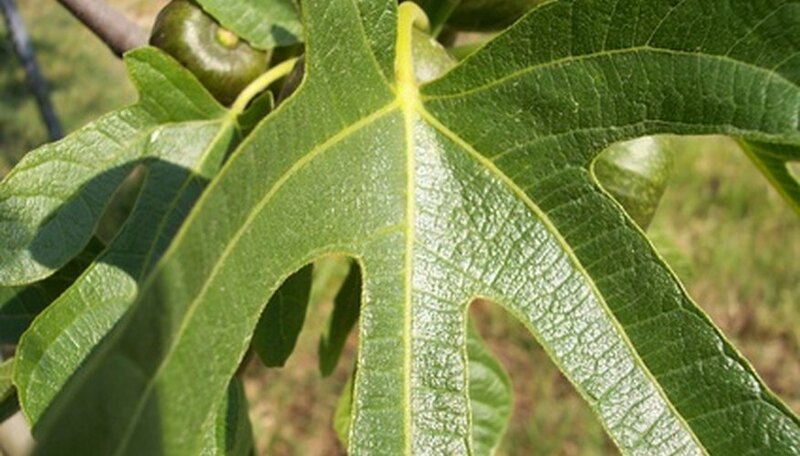 If the fig tree does show signs of yellow to brown leaves, the problem may be twofold. While basic sanitation will create a clean area around the tree, the fungus causing the brown leaves still must be eradicated. In most cases, a fungicidal application of 4-4-50 Bordeaux fungicide spray over the course of the summer will solve the problem. Inspect the fig tree to ensure no insects are causing the problem. Look over the tree trunk and on the underside of the affected leaves. If no insect egg casings are found, chances are the fig has a fungus problem. Remove all fig leaves from below and around the tree with the leaf rake. Move the leaves to an area far way from all fig trees. If possible, burn the leavers or place them in the trash to be removed from the property. Do not use the leaves in a compost pile. The fungus may lie dormant and be transferred at a later date. Mix the 4-4-50 Bordeaux fungicide spray according to the manufacturer's instructions inside the sprayer. If you wish to make your own spray concentrate, see the Resource section below. Cover as much of the foliage on the fig tree as possible with the spray solution. Apply another spray coating every three to four weeks during the summer. Keep all leaves raked up from around the infected tree. Dispose of the leaves in the fashion as described in Step 2 above.